Fruit producers will be able to see the latest developments in plant irrigation, vineyard and orchard management at this year’s Fruit Focus, helping them to improve outputs and efficiencies. Bringing together over 1,300 growers and industry professionals, as well as 120 leading exhibitors, Fruit Focus 2018 is set to cater for the needs of everyone in the sector. “Showcasing everything from pre- and post-harvest technology to agronomy, machinery, business information and marketing, this year’s event will be packed with valuable insights,” says Jon Day, event director at Fruit Focus. 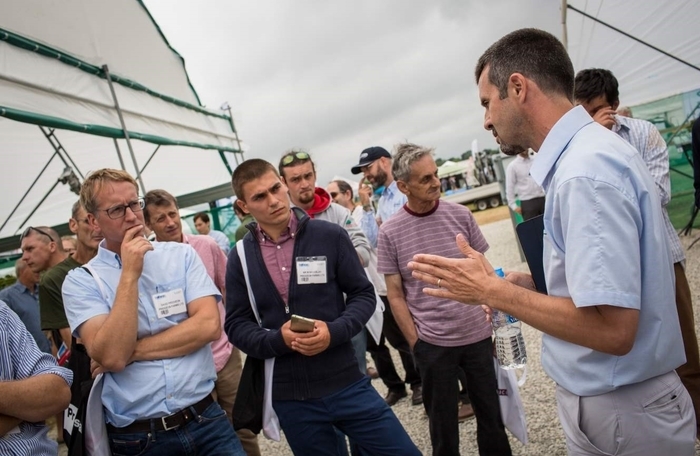 With constant pressures to optimise water usage and improve efficiencies NIAB EMR’s showpiece demonstration feature, the WET Centre, will showcase the latest techniques for growers. “In the WET Centre’s first full year of production we are anticipating a heavy crop of Malling Centenary strawberries,” says Prof Mario Caccamo, managing director at NIAB EMR. Over the past year the new automated stations have measured just 5% run off from 50-metre rows. And for growers looking to improve mildew control, a new auto-venting system used in conjunction with NIAB EMR’s mildew model will be on show in the ‘advanced technologies’ section. For growers interested in the latest advancements in strawberry production, a tour of the ‘Bumbleplus’ project, which aims to improve pollination in strawberry crops with bumblebees using caffeine, will be very insightful. It’s anticipated that this will add value to bee colony provision and enhance pollination. Along with two NIAB EMR PhD students, Dr Michelle Fountain will give an update on this interesting project. Growers wishing to see the latest research and developments in vineyard management need look no further than the vineyard tour. Fruiting for the first time since planting in 2015, attendees will be able to see new systems designed to save labour, protect against frosts and improve consistency of fruit quality and yields. The biggest recent change has been the planting of an extension for a new EU Horizon 2020 project on Integrated Weeds Management: ‘Praise’. The aim is to fully quantify and qualify potential alternatives to herbicides. In the study, next generation imagery will be used to compare weed control measures and their effectiveness. “The Chardonnay vineyard, planted on one rootstock, is set to be full of sensors and will yield an unparalleled scientifically-robust commercial view on developing best practice,” says Prof Caccamo. This ever-popular tour demonstrates different production techniques and new science, much of which has since been adopted by the UK pear industry. This year attendees will be provided with an update on cropping levels expected later in the 2018 season. Fruit Focus takes place on Wednesday 25th July 2018 at East Malling, Kent. Book your tickets at www.fruitfocus.co.uk.